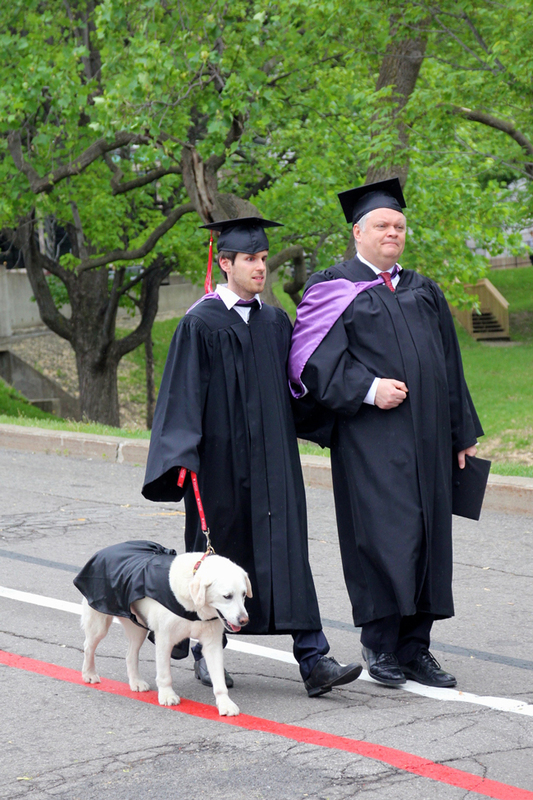 Earlier today, Thibault Trancart became the first blind person to graduate from the Desautels Faculty of Management. 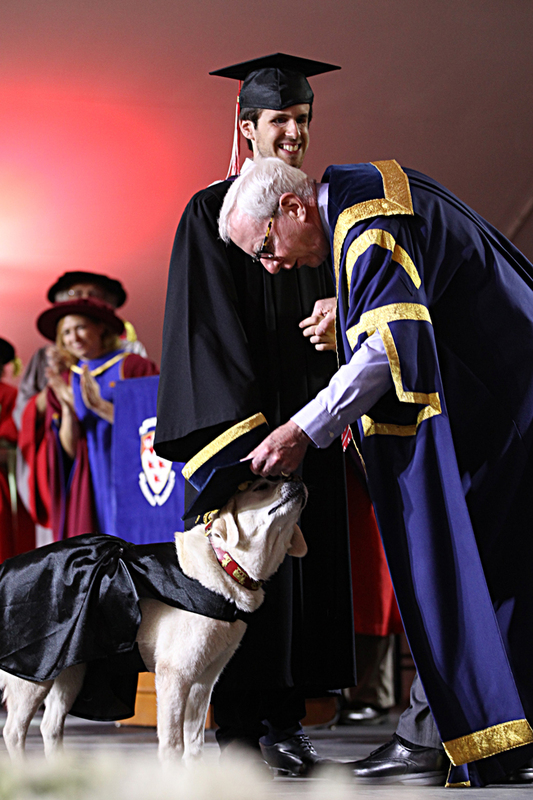 Trancart was accompanied across the stage by professor Richard Donovan and his faithful service dog, Fiona. Whatever you do, don’t tell Thibault Trancart that he can’t do something. Or better yet, go ahead and tell him – so he can prove you wrong. Trancart is the first blind person to graduate from Desautels. At age two, Trancart had his left eye removed after developing retinoblastoma – a form of cancer that attacks the retina. Three years later, the cancer spread to his right eye. “We tried everything possible but the cancer kept coming back,” he says. “By the time I was 14, a tumour had developed on the optic nerve very close to my brain. It was too dangerous so they removed it. It’s a drastic solution, but it works. An avid downhill skier who first hit the slopes when he was three, Trancart had no plans to give up his long-time passion. Instead, he hooked up with a guide who skis behind him, shouting positions on a clock (“11 o’clock… one o’clock”) for directions. And to all the naysayers, make no mistake, this is no pedestrian jaunt down the bunny hill. The duo has topped out between 80–90 kilometres per hour. At that speed, says Trancart with a wry chuckle, things can get a little hairy because the wind makes it hard to hear instructions. “I’ve been a skier with sight and without sight and, honestly, I love it even more being blind,” says Trancart. “Just in terms of the sensations, it is so much better, so much more exciting. Sometimes on powder you feel like you’re really flying. “At first I thought I would be terrified but since I couldn’t see anything below, I just said ‘What the hell?’ and went for it. Of course, you have to trust your guide 100 per cent and mine is amazing,” he says. “If there’s trouble, I know he’ll get me out. That isn’t to say Trancart hasn’t had his share of wipeouts. One particularly bad spill actually dislodged his prosthetic eye. Completely unfazed, Trancart plopped the stray eyeball into his pocket and finished his run. “I don’t know if Thibault’s fearless, but he’s about as close as anyone I know,” says Management Professor Richard Donovan, who first met Trancart while teaching Intro to Information Systems and another course called Case Analysis and Presentations. In the latter class, Trancart was picked as a member of the host team in McGill Management International Case Competition this past March. The only aspect of Trancart’s presentations that Donovan tweaked was having him fly solo without Fiona during his presentations. “Fiona is a character and a half, a real ham. She’s from Rome and Thibault jokes about her ‘Italian side’ when she’s not on the job,” laughs Donovan, who has ‘dog sat’ Fiona at his house on two occasions. “We quickly realized that Fiona was a distraction to some audience members. So I would take her to the back of the class to let people focus on Thibault rather than the cute dog. Enter Ruthanne Huising, another Desautels professor. “She had taken a real interest in me and told me that we would find a solution,” says Trancart. “She spoke to some people and suddenly solutions started pouring in. When I started second year, I was a lot more prepared to face the various challenges. Everything has gone well since then. Trancart worked closely with advisors from the Office for Students with Disabilities. As soon as he registered for classes, he would gather books and course packs and have them scanned as a pdf or word document. Trancart’s laptop is equipped with software that will read aloud emails and documents. He also enlisted the help of note-takers for some of his classes. But through it all, no one has worked more closely with Trancart than Fiona, his service dog since he was 14. As with any worker, a service animal’s career has a distinct shelf life and the 9-year-old Fiona is fast approaching retirement. In fact, as Trancart’s walk across the Convocation stage symbolized an important transition in his life, so too did that short journey all but mark all the end of Fiona’s days of service. “We’ll go through the summer, but when I return to Geneva in September, Fiona will be retired,” says Trancart. Retired, but not returned to the organization that trained her – a fairly common fate for many former guide dogs. Instead, Fiona will live with Trancart in Geneva, where he will navigate his hometown streets on a cane and a keen memory and she will be able to explore the Italian extrovert side of herself 24/7. “After everything we’ve been through together – we’ve grown up together… There’s no way I could give her back – I could never break that bond,” he says. Trancart was the last person to receive his degree. When Fiona – cape and all –appeared on the big screens inside the tent, the full house broke into spontaneous applause. When Professor Bruce Shore read Trancart’s name and “Fiona his guide dog and most faithful companion,” most of the crowd, including all of Trancart’s fellow graduates and the entire platform party, rose in ovation. True to her working form, Fiona didn’t flinch at the yelling and thunderous applause and wagged her tail ever so slightly when Kip Cobbett, Chairman of McGill’s Board of Governors, gave her the traditional tap on the head with his cap. There would be plenty of time for that back home in Geneva. Right now she still had a job to do. Brought tears to my eyes. Used to see this guy around and thought a course he attended. Great student. Truly inspiring! A very well written article which both touched all the bases necessary for a magazine like McGill Reporter and increased my understanding of the great achievement by Mr Trancart. Disability is certainly physical but as the writer makes evidently clear it is also social. How those around the disabled person react or don’t react causes the disability to be reduced or emphasized.